"It’s a busy time; we’ve just purchased another large batch of Clay Paky Sharpys for our rental inventory and they arrive this week, yet we’ll still have to sub’ in a few extra lights to keep our regular clients happy." Rob Merrilees at Dry Hire Lighting is managing growth with a wise head; note how he wasn’t tempted to buy just a few more to fill that equipment gap. "We will take those extra lights, check and prepare them to our standards, then off they go." ‘Our standards’ seems to be what sets Dry Hire apart, look at their website and the intention is clear, ‘providing lighting equipment to professional rental companies’, it says. "We don’t rent to end users, we don’t do production. This is plain black box rental," Merrilees confirmed. The company has grown five-fold in the 12 months since foundation in August 2012. "We build our relationships steadily. The investment we have made in Clay Paky equipment has been an important part of that growth; their distributor Ambersphere has given us fantastic support and truth is, the range of lights Clay Paky has is what everyone is asking for. We stock just about every model in the range now, from the 190W Sharpys right up to the 1500W Shotlights," explains Merrilees. As if to underline that statement Merriless added that "besides the Sharpys, we will also receive our first Aleda K10s and K20s this week. When Glyn O’Donohue at Ambersphere first demonstrated these to us we thought, well there are plenty of comparable LED heads already established in the market. ‘It’s the right time’ said Glyn, ‘these are brighter, faster and you can pixel map to them’. That’s how pro-active Ambersphere are, and he was right. Like the Sharpys, these too will be going straight out. You can apply the same rationale to the Sharpy Wash, another light we have recently invested in; yes there are comparably featured moving heads already in existence, but the Sharpy Wash is more compact and lighter; for a 330W lamp that’s amazing and it’s why they will become increasingly popular." 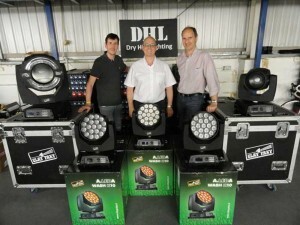 Dry Hire’s continued growth looks assured. "We set ourselves very high standards and we expect the same from our suppliers, that’s why we’re so satisfied with the back-up and service we get from Ambersphere. They go that extra mile, and that’s exactly what we deliver to our customers."